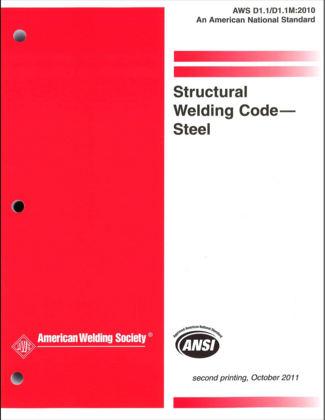 The most widely used welding code in North America, and perhaps the world, is AWS D1.1/D1.1M Structural Welding Code – Steel. It is specified as the quality standard in hundreds of contract documents every year. Yet, we find that less than half of the fabricators that need to use it have a sound understanding of how to follow what the code dictates. The number one reason why fabricators turn to AWS D1.1 is to qualify welding procedures and welders. However, this code contains much more than just details on the qualification process. D1.1 can be an invaluable tool that, when applied correctly, can prove to be a tremendous cost savings tool. The purpose of the code is to assure quality, so it reasons that when applied correctly and consistently the quality of the products you manufacture will increase. As quality increases and rework decreases substantial savings can be realized. This code provides way more detail that you ever thought was available when it comes to making welds on structural components. Yet, it is extremely hard to follow if you have never been given proper instruction on how to do so. It is definitely possible to pick up the code and teach yourself how to use prequalified welding procedures and how to qualify welding procedures by testing. However, with proper instruction you can avoid costly mistakes that are inevitable when you go it alone. Or, at the very least, you’ll be able to speed up the learning curve. If you ever have a chance to attend a D1.1 code clinic we encourage you to do so. D1.1 can be used as a basis for developing your own quality standards. As stated above, most of us only think of the welding codes only as instructions for qualifying welders and welding procedures and acceptance criteria for the inspection of welds. Welding codes contain much more than that. Before you can take advantage of the AWS D1.1 you need to understand what it includes. Below we provide a brief description of each of the 9 clauses. General Requirements – Provides the scope of the code including material thickness and strength ranges of structural carbon and low alloy steels. Also provides definitions for terms used throughout the code. Design of Welded Connections – Spells out requirements for the design of tubular and non-tubular structures for both static and cyclic loading. This clause contains a wealth of engineering information that can help you design weldments properly and avoid costly overwelding. It includes information for designing structures for both static and cyclic loading. Need information on calculating allowable stresses? It’s all in this clause. Understanding how to calculate the allowable strength for a given weld will allow you to design weldments and provide this information for the shop, rather than expect the shop to make engineering decisions such as the proper size of a weld. Prequalification of WPSs – Provides the requirements that need to be met in order to be exempt from having to perform testing to qualify welding procedures. The use of prequalified welding procedures has many advantages including saving time and money. If you have subscribed to our weekly articles you know that we developed a step-by-step guide on how to follow Clause 3 of AWS D1.1 in order to simplify the development of prequalified welding procedures. There are a lot of requirements that need to be met. They are spelled out in the code, but can be a bit tricky at times. Become very familiar with this clause. It can save you a lot of money by avoiding unnecessary welding procedure qualification tests. Qualification – Provides the requirements to qualify welding procedures, welders, welding operators and tack welders by testing according to code requirements. When prequalified welding procedures cannot be used then the qualification must be done by testing. This clause spells out all the requirements to qualify your procedures. Also, there is no such thing as prequalified welding performance, so all the qualification for welders must be done by testing according to Clause 4. 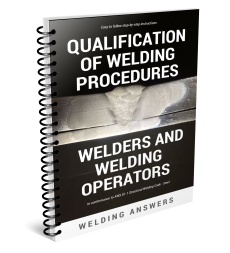 Qualification of Welding Procedures, Welders and Welding Operators has step-by-step instructions on how to qualify procedures and welders. Fabrication – Details requirements for base materials, welding consumables and workmanship for the erection of steel structures. If you are welding structural steels you should take this clause and make it your go to when designing products. It contains instructions on many different aspects of fabrication including: storage of consumables, use of fabrication aids, certification of electrodes, ambient temperature restrictions, baking of electrodes, fabricating with weathering steels, preheat and PWHT as well as stress relief heat treatment instructions and many other mandates for proper fabrication of structures. Inspection – Describes the requirements for qualification and responsibilities of inspectors. Provides proper procedures for inspecting welds visually as well inspection through other non-destructive methods. Clause 6 contains the acceptance criteria for the visual examination of welds for both statically and cyclically loaded connections. It also provide acceptance criteria for other types of nondestructive testing such as ultrasonic inspection (UT) as well as instructions on how to properly inspect welds with these NDE methods. Stud Welding – Describes requirement for welding studs to structural steel. Stud welding is used extensively in the fabrication and erection of steel structure so there are requirements imposed by the code on this welding process. Strengthening and Repairing Existing Structures – Provides the requirements for repairing and/or modifying existing structures. When working in accordance to specific welding codes such as D1.1, repairs need to be done according to the instruction approved by the engineer in charge. Repair procedures must be in place and followed. This clause provides information on design for strengthening and repair, fatigue life enhancement, workmanship and technique and quality. Tubular Structures – Provides additional requirements specific to tubular (pipe and box) structures. In the current of AWS D1.1 (2015) a significant change was made as compared to the previous edition (2010). Everything related to tubular structures (pipe or box) was separated and placed into its own clause – Clause 9. This simplified qualifications by separating tubular and non-tubular connections. Knowing what AWS D1.1 includes can be very useful as it can help you answer many questions that may arise during fabrication and inspection as well as during the qualification of welding procedures and welders. Also, if you are hoping to become a Certified Welding Inspector (CWI) you need to become familiar with codes. You can take part C of the CWI exam on D1.1 or other available codes such as D1.2, D1.5, D15.1, D1.17, API 1104 and ASME Section VIII and IX. To be a CWI you don’t need to be an expert on a specific code or be able to recall requirements off the top of your head. You simply need to know how to find information on the code books. You may test to D1.1, but your CWI certification allows you to perform the duties of a CWI according to any welding code. The CWI exam tests your ability to use a code with which you are not familiar and properly navigate through it and use it for inspection purposes among other things.